The maker of Tide, Bounty, Charmin, Pampers, Gillette and Crest brands reported anemic sales growth last quarter and it's losing the ability to control prices and maintain high profit margins. "This was a challenging quarter in a very tough environment," P&G chief financial officer Jon Moeller told analysts on a conference call Thursday. Wall Street analysts weren't having it: They asked Moeller tough, pointed questions, including about how the board defines success at the company. P&G's sales inched up 1%, while prices declined 2% and margins shrank 1%. The results sent battered P&G (PG) shares 3% lower. It's this year's second-worst stock on the Dow. Gillette's price drop was the company's steepest last quarter. Last year, P&G took down prices on the razors after losing market share to cheaper subscription upstarts Harry's and Dollar Shave Club. P&G also lowered prices on toothpaste last quarter. P&G's struggles aren't new. The company's performance drew the attention of activist investor Nelson Peltz last year. P&G waged an expensive proxy fight with Peltz over a seat on the board. Peltz narrowly lost the fight, but P&G gave him the seat. He took it on March 1. It's also not the only consumer goods company mired in a slump. "We have large businesses in several difficult markets. The ecosystems in which we operate around the world are being disrupted and transformed," CEO David Taylor said in a statement. 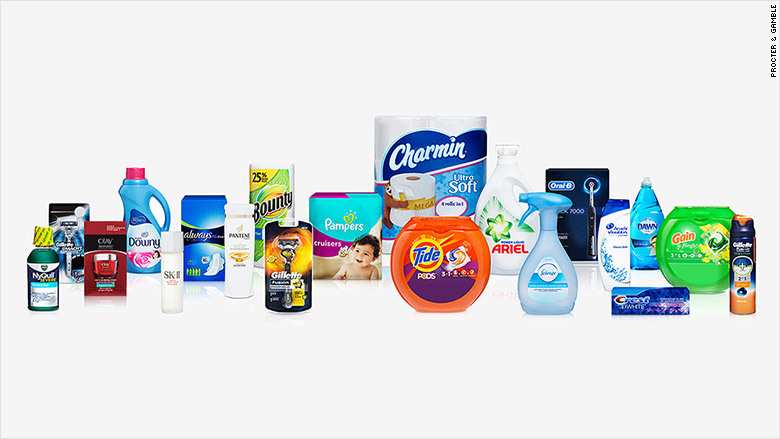 Rivals Clorox (CLX), Unilever (UL), Colgate-Palmolive (CL), Kimberly-Clark (KMB), Edgewell Personal Care (EPC) and Church & Dwight (CHD) are facing intense pressure. Clorox (CLX) lost 6% on Thursday following a Morgan Stanley stock downgrade. Today, the shopping landscape is fragmented. Smaller companies, often born online, can sell products directly to consumers. And retailers' private labels and discount stores have chipped away at big brands' market share. Their prices often beat P&G's higher end lines. "Competition is offering a very compelling value proposition that makes it hard for the household good companies to justify significant price premiums," said Kevin Keller, a marketing professor at the Tuck School of Business at Dartmouth University. In addition, online sellers like Amazon have hurt suppliers' margins. Brick-and-mortar stores, in a race to the bottom on prices to stay competitive, can force P&G to sell to them at lower costs. On Thursday, P&G announced a $4.2 billion deal for German pharmaceutical company Merck KGaA (MKGAF). It will own brands like Seven Seas vitamins and Nasivin nasal spray. "We believe personal health care will continue to be a financially attractive," Taylor said. "It's a huge category and about $230 billion in sales and with strong profit margins."